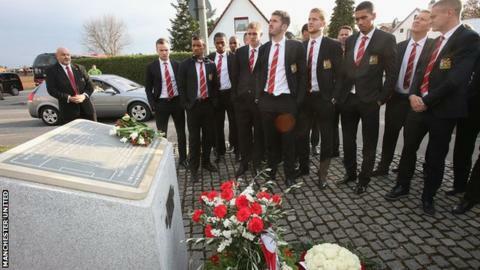 Manchester United's players paid their respects to victims of the 1958 Munich air disaster ahead of their Champions League match with Bayern Munich. Survivor Sir Bobby Charlton led the party as they laid tributes at a memorial in the city to the disaster. United midfielder Michael Carrick says the visit was moving for the players. "Paid our respects at the Munich memorial, a moving experience seeing group of United fans singing 'Man United will never die'," he tweeted. The disaster on 6 February 1958 claimed the lives of 23 people, including eight United players as the team returned from a European Cup match against Red Star Belgrade. The British European Airways (BEA) plane crashed during take-off after it had stopped to refuel in Munich before completing the journey from Yugoslavia back to England. It had been snowing in Munich and when the pilot attempted to take off for a third time the plane overshot the runway. A wing hit a house and the plane then struck another building, causing it to catch fire. Of the people to die, 21 did so instantly. Co-pilot Captain Kenneth Rayment died later from the injuries he sustained while Duncan Edwards - described by former United temporary manager Jimmy Murphy as the "greatest of them all" - passed away 15 days after the crash. United manager Sir Matt Busby was badly injured and had to have blood transfusions after the crash, while Charlton, now a director with the club, suffered minor injuries. At the time, the Busby Babes were attempting to become only the third club to win three successive English league titles. United face Bayern in a Champions League quarter-final second leg tie on Wednesday. They drew the first leg 1-1.